Ethiopia 2010: Salom from Addis Ababa! What a busy week we have had here in the capital of Ethiopia! As you may know, we arrive late on Monday night and were greeted by a tired but happy Negusse! Negusse is our guide and has been extremely helpful to our team during our time in Addis. We spent all of Tuesday running errands (i.e. getting a SIM card, exchanging money, etc.) and getting aquainted with the city (we visited the national museum!). On Wednesday we visited the Luke Society Clinic which is a clinic established in the Bole City area. It was founded specifically to bring access to health care to the poorer parts of the city. For just 5 burr, anyone in the area can be seen at this very intimate clinic. On Thursday we shadowed two relatively outstanding physicians at the ALERT hospital. These doctors taught us about Leprosy and a number of other conditions. They PIMPed us on the causes of vasculitis and the criteria for Lupus. Talk about a wake-up call. We wracked our brains as we tried to recall all of our first-year microbiology information! But it was a very nice session. I really do agree with everyone when they say that the problem in Ethiopia isn't so much the quality of doctors, as it is the quantity. All of the physicians we've shadowed are very competent! But there simply aren't enough of them! On Friday, we visited the Black Lion Hospital which (from what I can tell) is the "University Hospital" for the medical school here. It truly is a very technologically advanced hospital -- and once again, the doctors are very competent. It was nice to hear from the dean of the medical school their plans for increasing the class sizes so that there can be more doctors in Ethiopia. However, he also talked about how currently, the nation needs to find money to sustain that level of health care. On Saturday, we visited Kingdom Vision International which is an orphanage in Addis Ababa. It was started just two years ago. They are a relatively new NGO. It was really neat to sit down with Eyob and talk about his goals as an NGO for the reunion of children with their families and the impowerment of women in poverty. Nevertheless, Ethiopia has ~5 million orphans primarily caused by AIDS. It makes me a little sad. Our goal at the orphanage was mostly to spend time with the kids. When you live in a home with about 50 other children and only 5-10 adults -- one-on-one attention can get scarce. I think we all had a good time playing soccer and frisbee. I played with a little girl by the name of Mahador which was so lifegiving! She's incredibly bright and sweet. But it broke my heart when one of the caregivers asked me if I could adopt her, as she had no parents. And of course -- I had to explain that as a student, I don't have any means of taking care of another human being. Sunday was a reflection day -- and our team had some personal time to reflect on our time here and then to meet together to discuss how we are all doing and processing the things we've been seeing. And today, our team spent the day shadowing a US orthopedic surgeon at CURE Hospital. What a busy week it's been! In addition to all of that, we've found some time to cheer for the US in world cup soccer. We also got some really great time to head to the stadium and cheer for Ghana and Cameroon! The spirit of World Cup soccer in Ethiopia is so alive and it's been fun to get excited! Tomorrow we head to Aleta Wondo. For the next week we will conduct a women's health survey -- replicating a study that was conducted by our Haiti Team Counterparts in Haiti and on the Haiti/DR border this past winter and spring breaks. Afterwards, God-willingly, we will host medical clinics for the people of Aleta Wondo. (1) Health -- I've been sick for the past couple days and a number of people on our team have been feeling a little ill. Pray that we would all be well and able to function at 100% capacity. (2) Safe Travels -- As we travel the 8-ish hour journey to Aleta Wondo -- pray that our vehicles would work well and that we would have a safe and uncomplicated journey. (3) Medicines -- A number of our medicines are still sitting at the Ethiopian Ministry of Health. It seems that Dr. Usatine has obtained the necessary paperwork. Pray that there would be no further things to offset this necessity and that we would get these medicines soon! Thank you all for your continued support! We look forward to updating you again! Great to hear what you all have been doing! 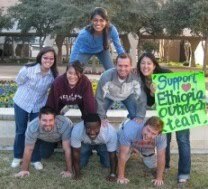 Thanks for serving in Ethiopia. I'll be praying for yall!